I've never actually read a book by Tamora Pierce, but I've wanted to for years. This is the third book in a series. Maybe its release will spur me to start Tamora's books. *How do you pronounce Tamora? I say Tah-MO-rah. Or is it TA-mo-rah, pronounced like the name Tamera? I've never read anything by this author either but the series sounds interesting. I haven't seen this one before but it sounds interesting... I hope you enjoy reading it when it comes out. This author is one of my favorites! Though, this book was not one of my favorite books; I just recently posted a review at mjreads.com. You should try reading "The Magic Circle" -- it is the beginning of the story for these characters. And "The Will of the Empress" In this same story is incredible! I have an ARC of this one and it's my next one to read! I'm looking forward to it. Great pick. Please check out my WoW! And take a look at our giveaway of Hostage Three by Nick Lake. I have yet to read anything by this author. I should remedy that. Thanks for sharing. I LOVE Tamora Pierce's books!! (in my head I say ta-MOR-a. Don't know if that's right) I'm definitely looking forward to this one. Ooh nice! I have yet to read any of her books, although I have heard of her! Hope you love this one! I've only read the Alianna series which I did over last summer and really enjoyed them. I would recommend them if you'd like fantasy that centers around a strong female character and that isn't too heavy on the romance. I plan on reading some more from this author. I haven't read any Tamora Pierce books either. I always see it and pass it by. I love fantasy too, so I don't know why I do. I don't think I ever read any of her books but looks awesome! 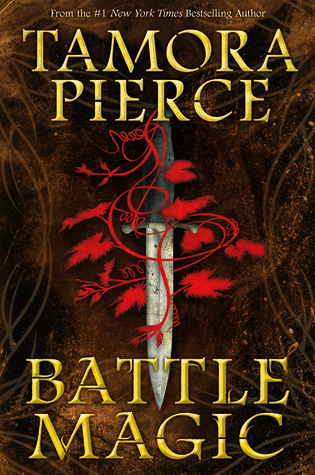 I am consistently surprised at the number of people who haven't read Tamora Pierce, but I could be biased since I quite literally grew up reading her books. I've been waiting on this book since she teased us cruelly with Briar's story in Will of the Empress, and that was seven years ago! Time flies when you're-- wait, not it doesn't. I havent seen this book around bu sounds really good! Cant wait to add it to my list. Love the cover. Great pick. I haven't read anything from her either, although I've heard such good things. I've never read anything by this author but it looks like something worth investing time into! And don't forget to follow! I say Tah-MO-rah, too. Though I am also a Tamora Pierce virgin. It's something that I frequently feel shamed about because as a YA reader, I feel like I should definitely be reading her books as she is like the Queen of YA. How have you never read a Tamora Pierce book before? I used to LOVE her Alanna series back in middle school and whole heartedly recommend her. I really think you'd enjoy her!